Leading off today: Two-time all-state running back Jeremiah Allen put the finishing touches on a Section 4 wrestling upset on Wednesday as Chenango Forks came out of the No. 4 seeding to earn a berth in the NYSPHSAA Division I dual-meet championships later this month. Needing to win his match to give Chenango Forks the victory, Allen pinned Horseheads' Jack Massengale in 30 seconds in the 170-pound match to clinch the Blue Devils' 45-42 win in the final. "It's one of the top things I've done at Chenango Forks," Allen said. "It was the most exciting feeling ever, probably more exciting than all the football things I've done. This is awesome." Earlier, Allen recorded a pin in 2:50 in Forks' 44-38 victory over top-seeded Corning. The Blue Devils have only 13 wrestlers and forfeited four weight classes in each match. Third-seeded Horseheads reached the final by rallying from a 21-point deficit to defeat defending champion Elmira 41-36 in its semifinal. Huge late rally: Williamsville South rallied from seven points down in the final minute of regulation to beat Amherst 72-71 in overtime in girls basketball. Tatyjana Scalisi (20 points) scored the tying basket with :02 left in regulation to pave the way for handing Amherst its first loss of the season. Amari DeBerry, the Billies' 6-foot-5 sophomore, led the way with 34 points and 10 rebounds in the rematch of last year's Section 6 Class A championship game. DeBerry scored the first basket of OT, Scalisi added a putback on the next possession and the Billies never trailed in the extra period. Boys basketball: The Monroe County League in Section 5 is deeper than any year in recent memory, and some of the depth took center stage Wednesday. Pittsford Mendon, ranked fourth in Class A, rolled to a 72-54 win over Greece Odyssey, ranked 14th in Class B. Senior captain Dan Cook finished with 29 points and 21 rebounds on the heels of a 40-point, 21-rebound performance against Brockport on Friday. • No. 22 Greece Athena pulled out a 64-61 victory over No. 16 Irondequoit behind 26 points from Melvin Council Jr. and 21 by Kelvin Reaves. 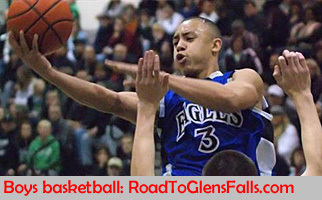 • Gates Chili (10-2) scored the final 11 points of the game and knocked off Hilton (8-2) 77-68. Adam Williams' three-point play with 2:25 left put the Spartans ahead for good. Williams and Keith Slack scored 21 points apiece. The Comets are 11-1 this season. Milestone: MiKenzie Martens totaled 10 kills and 14 assists as the Carthage girls volleyball team scored a 25-14, 25-5, 25-19 win over General Brown to register coach Angie Robbins' 400th career victory. More volleyball: Portville senior Beth Miller has been selected Gatorade's New York state player of the year after leading the Panthers to a NYSPHSAA Class C championship. The 5-foot-6 outside hitter and middle blocker recorded 552 kills, 266 digs, 177 services aces and 80 blocks in a 43-2 season. 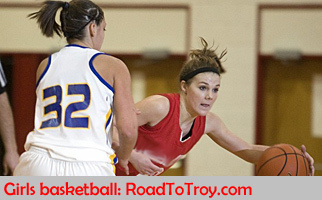 She has signed a National Letter of Intent with Edinboro (Pa.) University. Switching partners: The Minerva Central School District is changing partners in a consolidated sports program. The Minerva school board met last Thursday and approved an all-sports merger with Johnsburg beginning next fall. The school had been in a collaboration with Newcomb since 1993. Newcomb Superinten- dent Skip Hults said his school board asked Minerva for a one-year extension of its arrangement but was turned down. "If we had an extra year, I think we would've had more time to see how it's going to impact our budget and inves- tigate new mergers," Hults said. "For us it's very hard to merge." The combined BEDS total for the two Section 7 schools in 2017-18 was 52, down from 62 in the 2014-15 school year. Johnsburg, a Section 2 school about six miles from Minerva, had a BEDS number of 61 last school year. The Johnsburg school board is expected to OK the combining of programs Tuesday. Johnsburg combines with North Warren for golf, cross country and nordic skiing, and is expected to maintain that arrangement. "We're less able to consistently put full teams on the field or on the court," Minerva Superintendent Timothy Farrell said. "The problem is getting an adequate number of players, and it's getting worse, not better. ... It's consistently not possible for Minerva to have its own sports program, even with the merger with Newcomb, and we don't see that changing. So this is really out of necessity." With no other feasible merger partner on the radar, Newcomb's Hults said a shift in offerings could take place. "If we can't do baseball and softball in the spring, we have a golf course in Newcomb, we can do tennis, we can do gymnastics, we have an excellent archery club," he said. "So we'll be looking at it over the next couple of months."